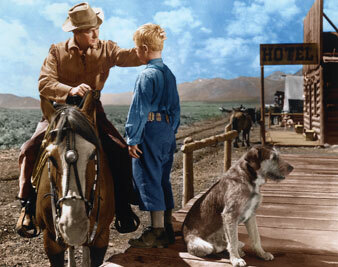 Everett Collection Alan Ladd and Brandon de Wilde in Shane, 1953. Stars: Alan Ladd, Jean Arthur, Van Helfin, Brandon De Wilde, Jack Palance. The past movie year will probably be generally remembered as the one in which three-dimensional gimmicks—multiple sound tracks, polaroid glasses, masking, wide curved screens, and other flashes in the panoramic craze—just about displaced the importance of content and quality. For me 1953 was the year in which Hollywood almost lost me as an irritable non-paying customer. The simple reason for my disaffection with H-movies—I ceased to he a foreign-movie fan when foreign films became so pretentiously unpretentious—is that there were few pictures last year in which the “human element” wasn’t swallowed up by production values. In this era of hard, tight semi-documentaries embroidered with fancying-up touches that seem controlled almost to rigidity, only an occasional Roman Holiday turns up with enough individual flourish to make one interested in any craftsmen but the lead actors. Wherever you look today, you find the movie artist subordinating himself in order to glorify a mechanical process. There was the wildly energetic dance scene in Moulin Rouge in which the speed, grouping, and rhythm of the dancers seemed indebted to the piston and lever. Even in Shane you found gimmicky stuff going on in every frame: the hero’s name was repeated so often in affected voices that it was like listening to a bird in a clock which instead of saying “Cuck-oo” gave out with a metallic nasal “Shane!” In Disney’s Living Desert actual mud puddles in the Salton Sea were made to burp, writhe, turn themselves inside out, and even spit in time to classical music by means of mechanical tricks. Mechanization of the artist has become the rage in other arts besides movies. In juke-box ballad-singing tiny voices like those of Como and Joni James are stretched, made earthy, sometimes even doubled and tripled, by the use of sound boxes and tape recorders. The most talked-of realistic painter—Wyath—does a surrealistically touched-up imitation of the camera image. Most of the important American abstractionists drip, scrub, or bleed paint on to canvas with an impersonal skill that makes it hard to believe human hands had anything to do with the painting. But it is particularly irritating to find movie artists over-indulging in mechanical tricks because the medium is so dependent on the immediate kinship set up between spectator and characters. How do you connect with the people in a movie like From Here to Eternity if their very brains and emotions seem ensnared in the delicate camera contortions that fuzz up the surface of a Zinnemann-directed film? This department saw nothing last year that deserved a Best Film award. Here, but not in any preferential order, are the seven films that gave me the most pleasure. First there was Alfred Hitchcock’s I Confess, a suspense yarn with too much talk and some polished semi-documentary photography (by Robert Burks) that was too obviously chopped up with symbols and oddly arranged angles for my taste. However, it had the most interesting acting of the year—by Anne Baxter. Roger Dann, and particularly Clift, involved in a methodically directed murder story in which the chief suspect is a young priest Clift won the year’s acting award for his ability to project states of mind and feeling with a kind of repressed toughness that became too obvious in the Eternity film. The movie was also noteworthy for the skill with which Hitchcock exposed the raveling out of a romance without wasting a motion, moving from the most romantic movie styling to the uncolored quality of a police report. Next there was The Young Wives’ Tale, a domestic comedy that seemed to have a screw loose and featured Joan Greenwood, the woman with a fog-horn voice and the manner of a slightly drowsy, kittenish narcissist. It was a fresh little British movie that gave you the sense of all hell breaking loose in a two-family house, while Miss Greenwood, a rather gawky Audrey Hepburn, and some others had fun in the manner of unregulated acting virtuosos. Sixth, George Stevens’s Shane, though it often seemed ridiculously arty and slow as its precise director attempted to give ballad-like stature to the ordinary ingredients of a cowboy story. But it is a movie that takes its own measured, deliberate time finding ways to increase your pleasure. Its key method was to provide an endless number of visual treats through the color photography of Loyal Grigg, who seems to have a genius for dramatizing moody stuff like the approaching shadow of a rain storm or the eerie night light on a porch. Unfortunately the spectator had to put up with some unbelievable fights, the overaged-child acting of Brandon De Wilde Palance’s phony cowboy costume, and the nasal delivery of Jean Arthur. Seventh, William Wyler’s Roman Holiday, a completely pleasing comic travelogue that seemed close to the first Garson Kanin comedies in its ability to inject heart and zip into zany human situations. It starred a rather cold and facile actress who turns on charm with a kind of trade-marked affectation. On the credit side it sported a clever rebelling-princess script, the tough stooge acting of Eddie Albert, good Cary Grant-type mugging by Gregory Peck, and direction that was masterful in its ability to manufacture small humorous details to delay the cliché twist in each segment of the story. My honorable-mention list includes The Man Between, The Naked Spur, Jeopardy (for the tension-heightening direction of John Sturges), Stalag 17, Bellissima (Magnani was the year’s best actress), Martin and Lewis’s The Stooge, Blowing Wild, The Moon Is Blue, Split Second (an unusually good performance by Stephen McNally), and Sky Full of Moon. In the worst-film category, I, the Jury, From Mainstreet to Broadway, and Return to Paradise were tied. Manny FarberEmanuel "Manny" Farber (February 20, 1917-August 18, 2008) was an American painter, film critic and academic. His film criticism has appeared during stints at The New Republic (from 1942), Time (1949), The Nation (1949-54), New Leader (1958-59), Cavalier (1966), Artforum (1967-71).